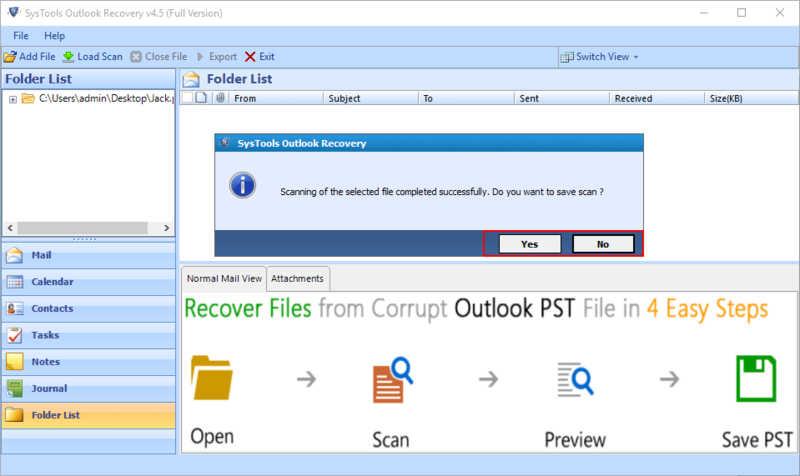 Outlook PST recovery tool provides two scanning options i.e. Quick scan and Advanced scan. Quick Scan mode recovers minor corrupted files whereas Advanced scan mode recovers highly corrupted or “Shift+Del” files. 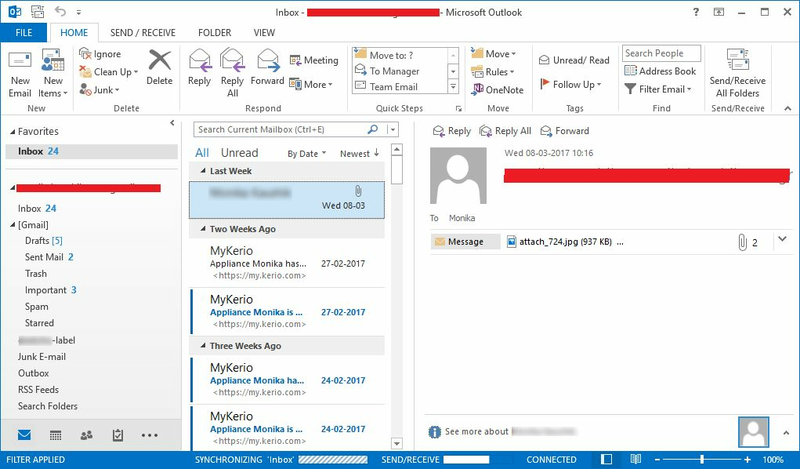 When scanning is performed, Outlook recovery tool previews all the emails stored in the PST file along with attachments. This preview lets you ensure that whether the data stored in PST file is recovered or not. Outlook deleted email recovery software helps you to recover all the data stored in PST file like Emails, Contacts, Calendars, Notes, Tasks, Journals and all other items in it. It will restore all the data whether it is deleted or hard deleted without making any changes to the folder hierarchy. After performing Outlook PST deleted file recovery, this software will maintain the formatting of the PST files same as it was before the recovery process. 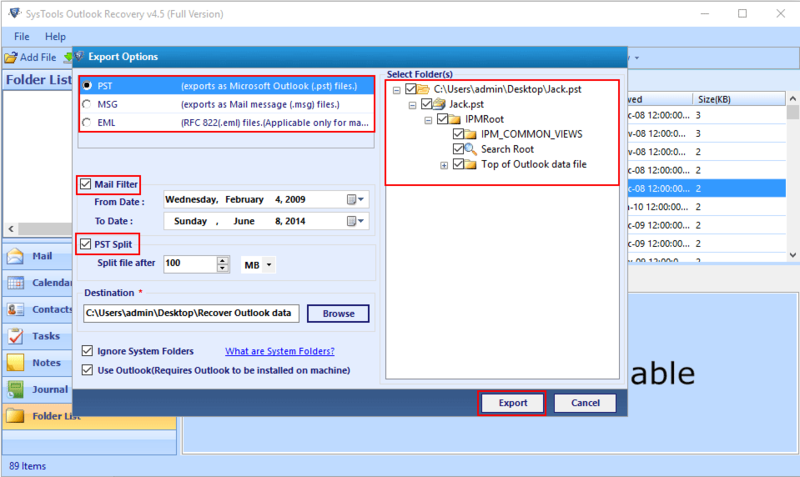 Outlook 2010 deleted email recovery tool will keep the meta data intact. Using this Outlook Recovery Tool, users are allowed to transfer their successfully recovered Outlook data to their O365 accounts. It not only repair damaged PST files, but also enables users to export their data in Office 365 account in bulk. When you want to select files to be recovered in Outlook 2016, 2013, 2010 deleted email recovery software, you can select a date range and filter all the emails to export them as PST, EML or MSG. PST Recovery Tool helps the user to export only selective mails from a specified date range. While saving recovered data to a particular location, you can select one of the naming option present from variety of naming options. Having such a variety of naming options helps you to have better manageability of the recovered data. By default, the messages are saved by its respective subject in Outlook PST Recovery Software. The screen view mode of PST File Repair Software can be switched between horizontal or vertical. By default, the selected screen view mode is horizontal but you can switch your view mode to vertical if required. You can split large PST file into smaller ones using the split PST option and recover PST file. You can select any size ranging from 1 GB to 45 GB and create PST of same size which is easier to manage. 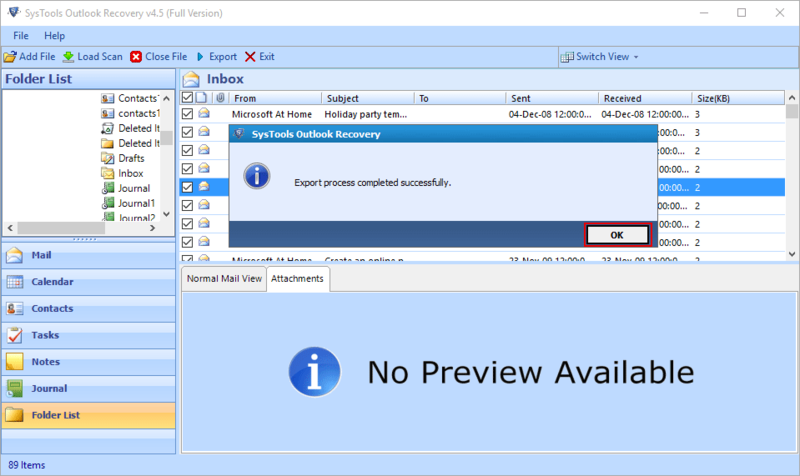 Graphical User interface of the Outlook recovery tool resembles the user interface of MS Outlook. As a result, it makes it easier for you to use this software. 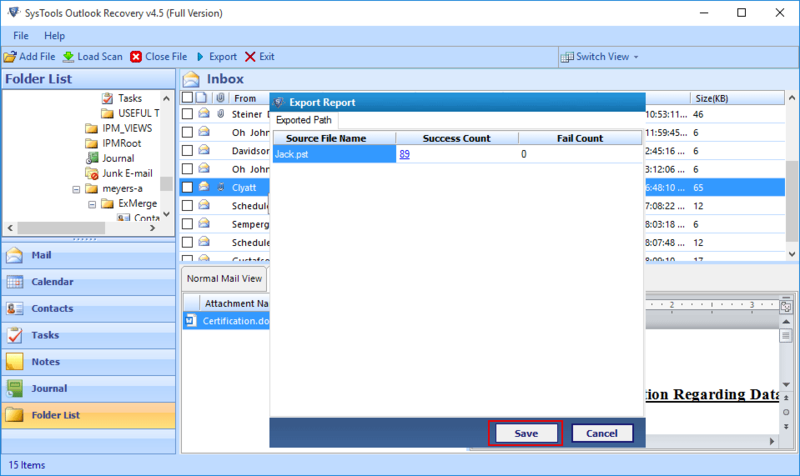 Once all the items get successfully exported, Outlook Recovery software generates an export report with location of selected mailbox and exported file. You can also save the export report as .csv for future reference. Hard disk space : 60 MB of free hard disk space required. 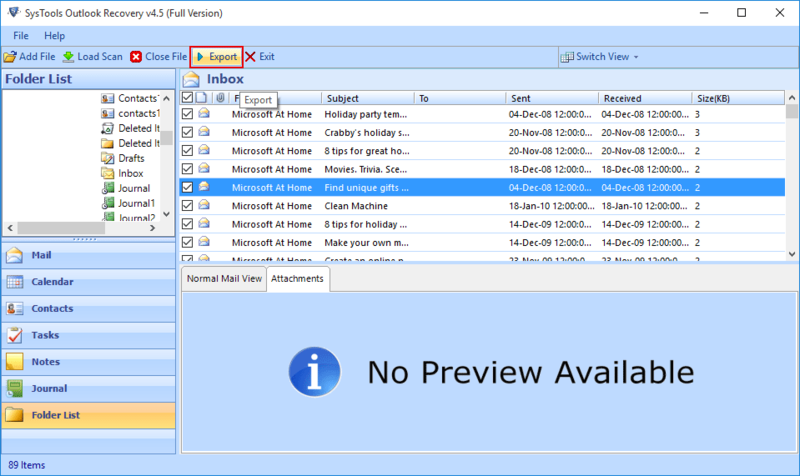 Download trial version of Outlook PST File Recovery tool free of cost on your operating system. The tool will work similarly like the full version but it will only recover 25 items/folder. What are the reasons of PST file corruption and how to fix them? Incorrect file recovery – A file system recovery tool may cause file corruption as some parts of the file may be lost permanently or overwritten by garbage data. As a result of which it makes the PST file incomplete or contain incorrect data. Virus or Other Malicious Software – Many viruses are developed whose only intention is to corrupt your files as much as possible So, its solution is to install quality anti-virus on system to protect your system from these types of viruses. Outlook Termination abnormally – If your Outlook shuts down abnormally when you are accessing or opening a PST file then the PST file is prone to corruption. This can happen when power failure occurs, you terminate Outlook through ‘Windows Task Manager’ or turn off your system abnormally. Does this software works on Windows 10 OS? Yes, Outlook PST Recovery tool runs on all versions of Windows OS including 2000, 2003, 2008, XP, Vista, Windows 7, Windows 8/8.1 and the latest Windows 10 OS. 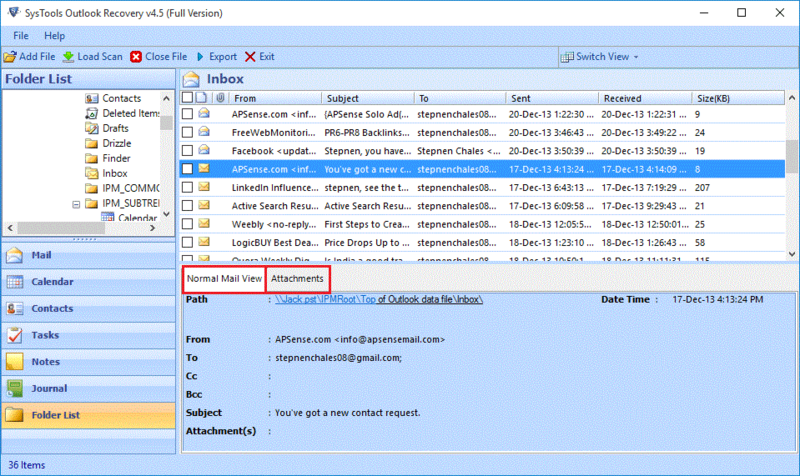 Can I recover hard deleted emails using your tool? Yes, you can easily recover deleted items from PST file whether it is email, contacts, calendar, journals, etc. using Outlook deleted email recovery software. 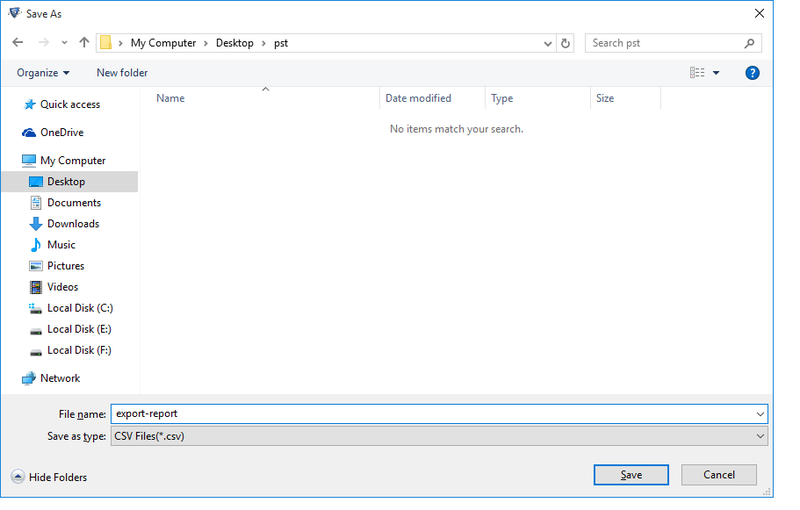 Does your tool restore deleted Outlook calendar file from my account? Yes, Using Outlook Recovery tool you can retrieve all your calendar items as well as emails, contacts, notes, journals items from your account. Can I recover deleted items from PST file in Outlook 2013? Yes, Outlook PST recovery software is compatible with Outlook 2016(32/64 bit), 2013(32/64 bit), 2010(32/64 bit), 2007, 2003, 2000. Does this tool recover deleted PST file? No, Outlook Recovery tool only recovers deleted items from PST file. If you want to recover deleted PST file, then you can use our data recovery tool. Do I need to install Outlook in order to recover PST file of Outlook 2016? No, you don't need to install Microsoft Outlook if you want to recover Outlook data file. 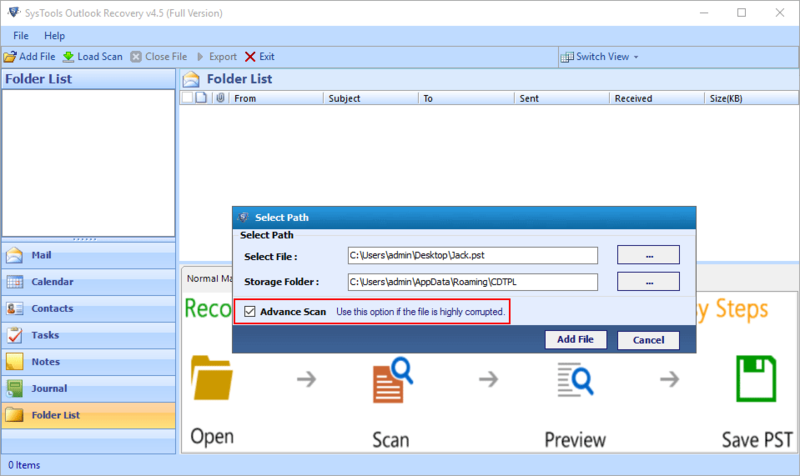 Outlook PST Recovery tool not only offers file recovery but also provides the functionality to split large PST files into smaller ones which further reduces the chances of file damage and data loss. This tool also offers to export data of specified date range into desired format. I was searching for a tool using which I can recover damaged PST files and this Outlook recovery software fulfilled all my needs. 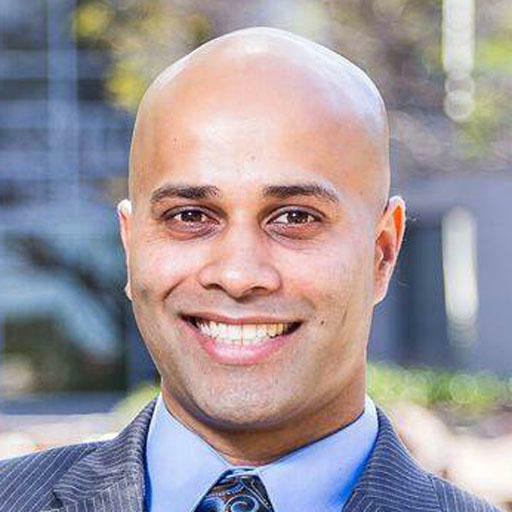 First, I tried the demo version of this tool just to be safe but after using the demo version I was fully confident about the ability and performance of the product so I purchased licensed version of it. My PST file was corrupted and I was not able to access it. Then my friend suggested me to use Outlook Recovery tool and told me some of its features. 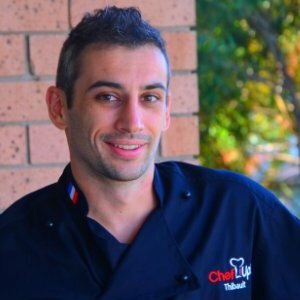 I tried this tool and it works perfectly. I will recommend everyone to use this application whoever wants to repair or recover corrupted PST files. 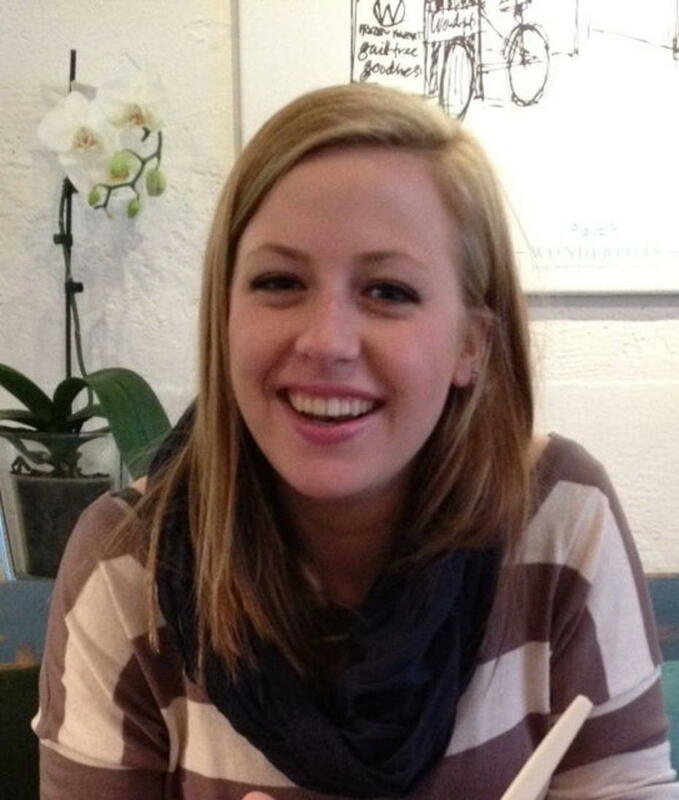 Thanks to its development team. 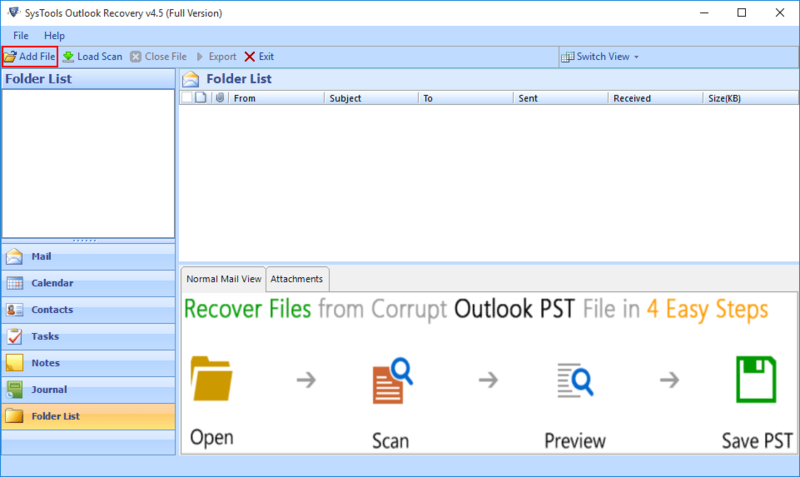 Note: If your PST file is highly corrupted then opt for Advance Scan mode as it allows you to recover highly corrupted Outlook files.